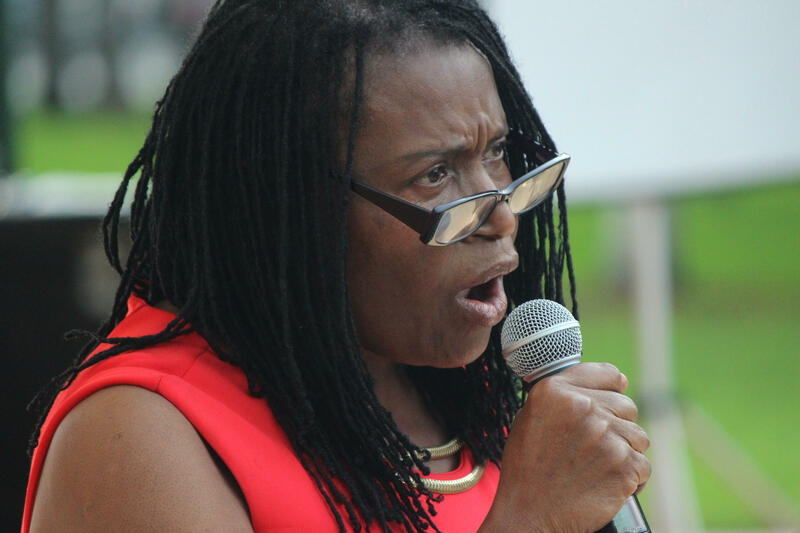 Marleine Bastien, the executive director of the Family Action Network Movement for Haitian Women of Miami, speaks on climate gentrification impacting areas like Little Haiti on Saturday, September 8, 2018. 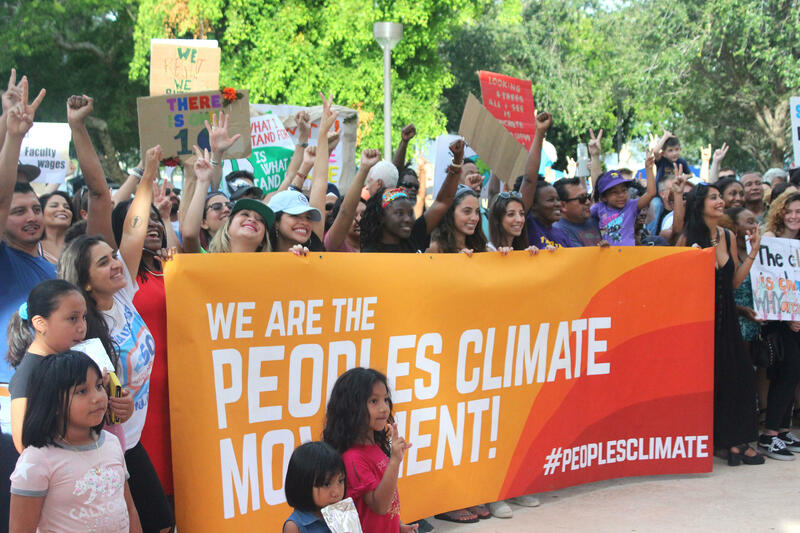 Hundreds of South Florida activists and community stakeholders gathered in Bayfront Park to rally for Miami climate resiliency on Saturday, September 8, 2018. 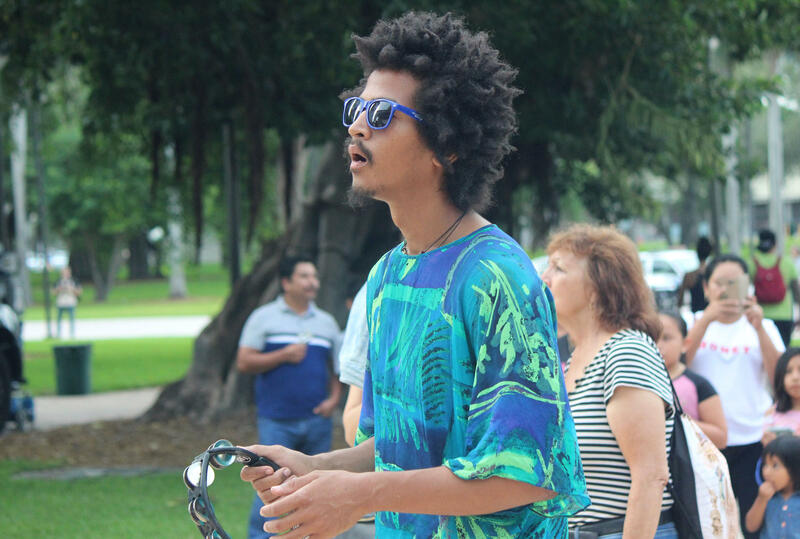 The event, “Miami Rising for Climate, Jobs and Justice,” was a collaboration between climate and immigrant community organizations, musicians and experts on sea level rise and climate change. They discussed issues like climate gentrification in immigrant communities and the importance of voting for politicians who pledge to move climate action off the backburner. 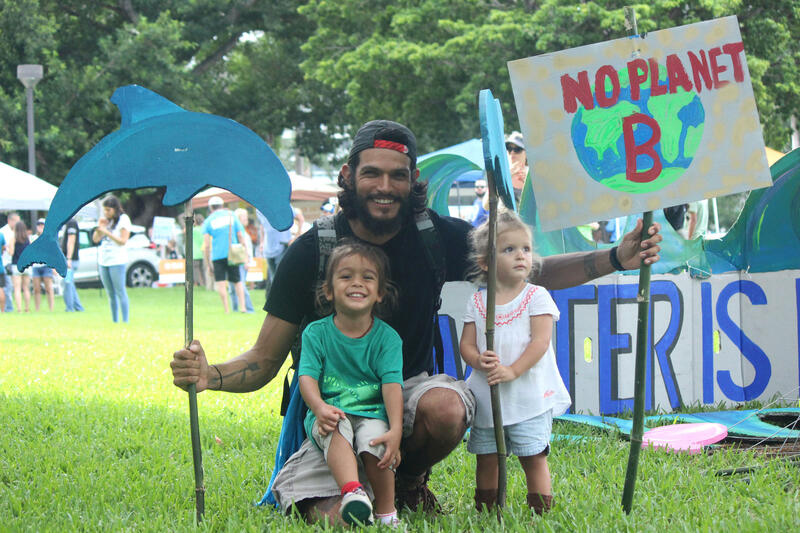 Hundreds rallied for climate action and a more proactive approach for Miami to be climate resilient in Bayfront Park on Saturday, September 8, 2018. Many also held signs with poetry from artist Dita Devi, who performed at the event. 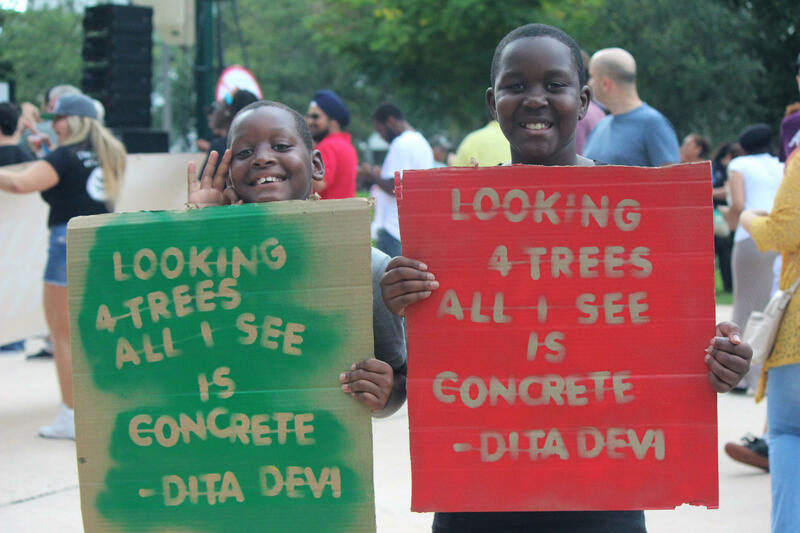 Hollywood poet and painter Dita Devi said South Florida residents have lost a connection with the environment, which ultimately impacts health. “I don’t care where you live in Miami - if you have a 'view,' you’re looking at a bunch of cranes, you’re breathing in all that construction air, and it has an affect on all of us,” she said. 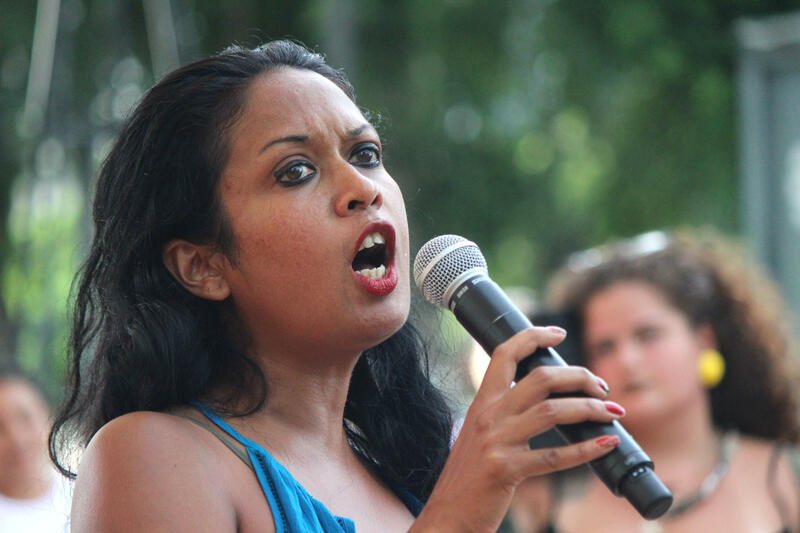 Poet and painter Dita Devi performs at the Miami Rising climate rally on Saturday, September 8, 2018. Devi and a team of about 10 collective artists created a “Life is Art” tent at the rally to showcase the ways climate change affects health. In one of her paintings, a child holds an inhaler, struggling to breathe. 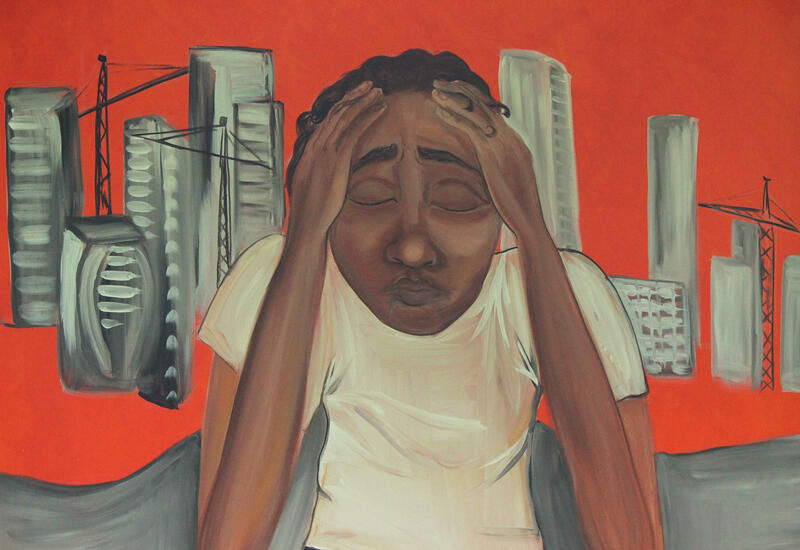 In another, she focuses on depression and anxiety, depicting a hunched-over man surrounded by concrete and cranes. River Horan and his family live in El Portal, close to Miami Shores, and they enjoy canoeing and paddling in Florida's waterways. They took action by rallying at the Bayfront Park rally on Saturday, September 8, 2018. Other speakers at the event included Marleine Bastien, the executive director of the Family Action Network Movement for Haitian Women of Miami. She came to Miami from Haiti as a refugee in 1981, and hasn’t left her neighborhood in Little Haiti since. She said Miami is unique in that climate change intersects with gentrification in a new, complex way not seen in other areas around the country. In South Florida, sea level rise means more developers are looking at communities like Little Haiti or Overtown because of their higher elevation. She demanded that elected local officials address climate gentrification in areas like Little Haiti and Historic Overtown. “Little Haiti today is facing the fastest gentrification process in this country as a result of climate change and climate gentrification,” Bastien said. A mural painted by artist and poet Dita Devi shows a hunched-over man surrounded by smog, concrete and construction cranes in Bayfront Park on Saturday, September 8, 2018. Her "Life is Art" tent at the Miami Rising climate rally aims to show the impact climate change has on health. “We must pay attention to what’s going on in our environment, we must pay attention to what’s going on with families facing displacement in neighborhoods that they built, we must pay attention to our streets flooding,” she said.